Objective To assess whether the obesity paradox persists in the long term and to study the effect of optimal medical treatment on this phenomenon. Design A retrospective cohort study. Setting A tertiary care centre in Rotterdam. Participants From January 2000 to December 2005, 6332 patients undergoing percutaneous coronary intervention for coronary artery disease were categorised into underweight (body mass index (BMI)<18.5), normal (18.5–24.9), overweight (25–29.9) and obese (>30). Secondary outcome measures Cardiac death and non-fatal myocardial infarction. Results Optimal medical treatment was more common in obese patients as compared with normal weight patients (85% vs 76%; p<0.001). At a mean of 6.1 years, overweight and obese patients had a lower risk of all-cause mortality (HR: 0.75, 95% CI 0.66 to 0.86 and HR: 0.72, 95% CI 0.60 to 0.87, respectively). After adjusting for OMT in the multivariate analysis, BMI did not remain an independent predictor of long-term mortality (HR: 0.90, 95% CI 0.72 to 1.12 and HR: 1.07, 95% CI: 0.80 to 1.43, respectively). Conclusion BMI is inversely related to long-term mortality in patients treated with percutaneous coronary intervention. Patients with a normal BMI are on suboptimal medical treatment when compared with those with a high BMI. A more optimal medical treatment in the obese group may explain the observed improved outcome in these patients. Whether the obesity paradox persists in the long term. The effect of optimal medical treatment (OMT) on this phenomenon. Body mass index (BMI) is inversely related to long-term mortality in patients treated with percutaneous coronary intervention. Patients with a normal BMI are on suboptimal medical treatment when compared with those with a high BMI. A more optimal medical treatment in the obese group may explain the observed improved outcome in these patients. Strengths of this study are that we examine the long-term effects of BMI on outcome and we try to explore the mechanisms of the obesity paradox. Limitations of the study are that we cannot prove the mechanism with an observational study and that details about OMT, such as duration of therapy and medication adherence, are lacking. Most studies examining the role of BMI on mortality in patients treated with percutaneous coronary intervention (PCI) have focused on the short-term effects,6–10 while only a few studies examined the impact of BMI on long-term mortality.11–14 While many studies have examined the obesity paradox, only a few studies explored the mechanisms of this phenomenon.4 15 16 A more aggressive lifestyle modification and optimisation of medical treatment may be a plausible reason for the enhanced survival in individuals who are obese at the time of coronary revascularisation. Hence, the aims of this study were (1) to evaluate the effect of BMI on long-term mortality in a consecutive series of patients treated with PCI and (2) to determine whether a difference in the use of optimal medication at follow-up between the different BMI groups is a contributing factor for the obesity paradox. Between 1 January 2000 and 31 December 2005, a total of 7217 PCI's were performed in our institution. Bare metal stents were used exclusively in 2681 PCI's performed between January 2000 and 15 April 2002. Subsequently, 1035 interventions were performed between 16 April 2002 and 23 February 2003, using sirolimus-eluting stents (Cypher®; Cordis Corp., Johnson & Johnson, Warren, New Jersey, USA), as part of RESEARCH registry.17 The following 3339 interventions from 23 February 2003 to 31 December 2005 were performed using paclitaxel-eluting stents (TAXUS Express2 or Liberté; Boston Scientific, Natick, Massachusetts, USA), as part of the T-SEARCH registry.18 Only patients (n=6332) with registered baseline weight and height were eligible for inclusion in the current study. The study was performed in line with ethical guidelines in accordance with the Declaration of Helsinki. Demographic variables included gender, age, height and weight. Information on clinical variables (ie, dyslipidaemia, hypertension, smoking, diabetes mellitus, family history of coronary artery disease (CAD), indication for PCI, previous myocardial infarction (MI), previous coronary artery bypass graft surgery, previous PCI, multivessel disease and left ventricular ejection fraction (LVEF)) were prospectively collected at the time of the procedure and recorded in the institutional database. Dyslipidaemia was defined as total cholesterol levels ≥240 mg/dl (6.21 mmol/l) or if the patient was on lipid-lowering medication. Hypertension was defined as blood pressure >140/90 mm Hg or if a patient was being treated with antihypertensive drugs. Diabetes mellitus was defined in patients being treated by oral antiglycaemic agents or insulin. BMI was defined as weight in kilograms divided by the square of the height in metres. In our institution, height and weight are self-reported unless the patient does not know in which case this is performed in the referral clinic. Categorisation of BMI was adopted from WHO and the National Institutes of Health19 and defined as underweight (BMI <18.5 kg/m2), normal weight (18.5–24.9 kg/m2), overweight (25–29.9 kg/m2) and obese (≥30 kg/m2). End points were all-cause mortality, cardiac death and non-fatal MI, and major cardiac events (a composite of cardiac death or non-fatal MI). Cardiac death was defined as death from any cardiac cause including sudden cardiac death, MI, congestive heart failure, cardiac arrhythmias and death in which there is evidence of a primary cardiac cause that could not be classified as mentioned above. Sudden cardiac death was defined as unexpected natural death due to cardiac causes within 1 h of onset of acute symptoms. Criteria of MI diagnosis included two or more of the following: (1) typical chest pain lasting for more than 20 min, (2) development of typical electrocardiographic changes (new Q waves >1 mm or >30 ms in two contiguous ECG leads), (3) elevated levels of serum markers for cardiac necrosis (creatine kinase (CK) >2 or CK-MB level >3 times the upper limit of normal). Information about the in-hospital outcome was obtained from an electronic clinical database maintained at our institution and by review of the hospital records for those transferred to other hospitals. In-hospital outcomes are included in the 6-year outcome. Post-discharge survival status was obtained from the Municipal Civil Registries. Questionnaires with information about anginal status, repeated hospital admissions, revascularisation procedures and medication use were sent to all living patients on a yearly basis. The hospital records, referring physicians and institutions were consulted for additional information whenever necessary. Events were adjudicated by two independent cardiologists according to criteria defined above. Categorical variables were compared with the χ2 test and continuous variables with analysis of variance. Univariable and multivariable Cox proportional hazard regression analyses were used to examine the relation between BMI and the defined end points. All BMI classes were entered into the model, with normal weight patients (BMI 18.5–24.9 kg/m2) as the reference. Multivariable analysis was adjusted for all baseline characteristics, which were available for all patients included in the study. Optimal medical treatment was added to the model to assess its importance as an independent predictor. Kaplan–Meier curves were generated to graphically present the time to death for patients in the different BMI groups. Additionally univariate and multivariate Cox regression analysis was performed with BMI as a continuous variable to determine the relation of an increase in 1 kg/m2 and the primary end point. The effect of the introduction of optimal medical treatment (OMT) on the model was tested as in the models with BMI as a categorical variable. Landmark Cox regression analysis at 2-year follow-up was performed to assess for changes in predictors of the end point mortality and to determine the effect of OMT on late outcome. Patients lost to follow-up were considered at risk until the day of final contact, at which point they were censored. The log-rank test was used to ascertain whether differences between groups were statistically significant. All tests were two tailed and a probability value of <0.05 was considered statistically significant. For Cox proportional hazard regression analyses, HRs and their corresponding 95% CIs were reported. All data were analysed using SPSS V.17.0 for Windows (SPSS Inc.). Follow-up on survival status was available for 98% of patients. The average follow-up time was 6.1 years (range 3–11 years). In total, there were 1059 deaths (17%) of which 454 (43%) were cardiac. The small size (n=35) of the underweight group precludes any reliable analyses and the group was therefore excluded. Patient baseline characteristics and clinical data according to the three BMI categories are shown in table 1. Obese patients tended to be younger, and although the overall population was predominantly comprised of men, gender was more equally represented in the obese group. Dyslipidaemia, hypertension and diabetes mellitus were more common in the obese group, while current smoking was more prevalent in the normal weight group. The different types of medication used at follow-up according to the three BMI categories are shown in table 2. Obese patients tended to use more β blockers and ACE inhibitors compared with the normal weight group resulting in more optimal medical treatment at follow-up in the obese group. Univariate and multivariate associations between BMI and long-term outcome are presented in table 3. Clinical characteristics that had a significant association on multivariate analysis were age, gender, diabetes mellitus, multivessel disease and LVEF. In univariate analyses, overweight and obese patients had more favourable long-term outcomes in terms of all-cause death (HR: 0.72, 95% CI 0.63 to 0.82 and HR: 0.61, 95% CI 0.51 to 0.74, respectively) and cardiac death (HR: 0.77, 95% CI 0.63 to 0.94 and HR: 0.73, 95% CI 0.56 to 0.95, respectively). 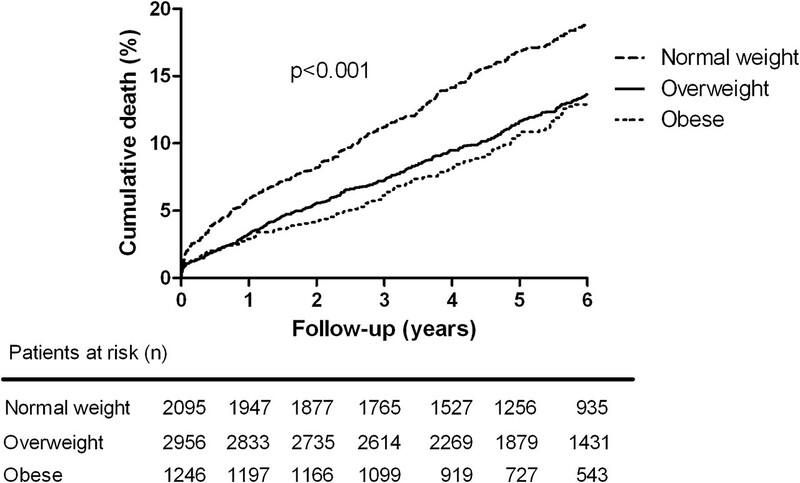 (table 3, figure 1) Overweight patients also showed a lower risk for the composite end point of cardiac death and non-fatal MI (HR: 0.84, 95% CI 0.71 to 0.99). Most of these differences remained significant after multivariate adjustments for all baseline characteristics. However, the lower incidence of cardiac death in obese patients did not remain significant after multivariate analysis. Moreover, when adjusting for baseline characteristics and optimal medication at follow-up, overweight and obese patients had a equal long-term survival (HR: 0.90, 95% CI 0.72 to 1.12 and HR: 1.07, 95% CI 0.80 to 1.43, respectively) compared with the normal weight group. Kaplan–Meier survival curve for all-cause mortality in normal weight, overweight and obese patients at 6-year follow-up. In a model with BMI as a continuous variable, one unit increase in BMI showed HR 0.95 (95% CI 0.93 to 0.97), p<0.001, adjusted HR 0.96 (95% CI 0.95 to 0.98), p<0.001. When OMT was introduced in the model, the relation did not remain significant: HR 1.00 (95% CI 0.98 to 1.03), p=0.81. For the whole population, OMT had HR 0.63, for the normal population 0.60, for the overweight 0.64 and for the obese 0.69. In a landmark analysis at 2 years, multivariate predictors of late outcome included gender, BMI, age, hypercholesterolaemia, diabetes mellitus, family history of CAD, previous coronary artery bypass graft surgery and LVEF. The introduction of OMT in the 2-year landmark Cox regression model also altered the significance of BMI from overweight versus normal (HR: 0.806, 95% CI 0.678 to 0.960, p=0.015) and obese versus normal (HR: 0.840, 95% CI 0.661 to 1.067, p=0.152) in the model without OMT to overweight versus normal (HR: 0.911, 95% CI 0.722 to 1.149, p=0.429) and obese versus normal (HR: 1.122, 95% CI 0.819 to 1.537, p=0.472) in the model with OMT. The individual medications were analysed in a separate Cox regression model and statin use showed the strongest independent protective effect on long-term mortality, statins HR 0.60 (95% CI 0.46 to 0.78), p<0.0001. All the other three medications also showed independent protective effect as follows: aspirin HR 0.75 (95% CI 0.60 to 0.95), p=0.014, β blocker HR 0.83 (95% CI 0.66 to 1.04), p=0.109, and ACE inhibitors HR 0.84 (95% CI 0.69 to 1.03), p=0.093. This study confirms the validity of the ‘obesity paradox’ with an inverse relation in all-cause mortality and BMI of patients undergoing percutaneous revascularisation in the long term up to 6 years. Patients with higher BMI at baseline have more optimal medical treatment, which may explain the reduction in mortality as observed in these patients up to this time point. In the current study, we found that the inverse relation between BMI and mortality persists during long-term follow-up of patients treated with PCI. The overweight and obese groups showed almost 30% lower mortality than patients with a normal BMI. In this population, crude death rate was 17% during a mean follow-up of 6 years. Cardiac deaths were responsible for 43% of all deaths. As expected, comorbid conditions (eg, dyslipidaemia, hypertension and diabetes mellitus) were more prominent in the obese population. Several other studies have shown a paradoxical effect of moderate obesity on outcome after PCI.6–12 They also found significantly worse outcomes in patients with a BMI >30 or <20 kg/m2. These results were echoed in a large meta-analysis by Romero-Corral et al21 who included studies with a total of 250 152 patients undergoing PCI or coronary artery bypass grafting. In fact, overweight and obese patients with coronary heart disease had a lower risk for total and cardiovascular mortality compared with underweight and normal weight patients with coronary heart disease. Our study results are in line with these findings; however, while the duration of the follow-up period in most of these studies was restricted to 1 year, that period was extended to 6 years in the current study. In this study, the impact of differences in optimal medication, one of the implicated mechanisms of the obesity paradox, was explored. Strikingly, we did notice that optimal medical treatment was more common in the high BMI groups, likely a reflection of the higher incidence of risk factors in these subgroups. Our study supports the hypothesis that part of the obesity paradox may be mediated by the earlier and more complete secondary preventive medical treatment in the high BMI groups who present for revascularisation at a younger age. Aspirin, statin, β blocker and ACE inhibitor use have all shown significant reduction in mortality in previous studies.27 In our study cohort, patients with a higher BMI were more often on β blocker and ACE inhibitor treatment when compared with subjects with normal weight. The positive effect on survival in the long-term of such drug treatment is an important contributor to the apparent survival advantage that is observed in patients with a high BMI. Thus, at least in part, OMT explains the obesity paradox. Moreover, our study highlights the importance of optimising medical treatment and encouraging compliance even in patients with good symptom control achieved after percutaneous revascularisation for CAD. The beneficial effect of OMT in the higher BMI group may have been influenced by a change in lifestyle. The change in BMI over time and measures other than OMT such as exercise and dieting may have contributed to the improved long-term prognosis in these patients. Baseline clinical characteristics of patients with a high BMI suggest that these patients have a higher risk profile compared with those with normal or low BMI. Clearly, patients with high BMI undergoing PCI have a more optimal medical treatment. Whether more active screening related to the obesity and cardiovascular risk factors is leading to a more timely and aggressive pharmacological and/or mechanical intervention in this population remains to be established. In an era of stent implantation as a mainstream treatment for CAD, stent-related factors may also influence the impact of BMI on clinical outcome. Although in our study we were not interested in stent-related outcomes such as stent thrombosis and stent restenosis with target lesion revascularisation, these two may play a role in hard end points especially in the long term. Patients with a high BMI have been shown to have higher rates of target vessel revascularisation possibly reflecting more aggressive neointimal hyperplasia in the stent, progressive disease in the treated vessel or a combination of the two.14 The coexisting cardiovascular risk factors (hypertension, dyslipidaemia and particularly diabetes mellitus) in these patients are thought to play a major role in these mechanisms of target vessel failure. Stent thrombosis has an even more direct effect on hard end points since it causes an MI and sometimes sudden cardiac death even before presentation. Patients with a high BMI are thought to be at a higher risk possibly due to suboptimal dosing of dual antiplatelet treatment.14 Thus, although stent-related factors can potentially influence the relation of BMI and outcome, the mechanisms implicated do not support the obesity paradox that we observe. The current study has a number of limitations that need to be highlighted. Data regarding waist circumference and waist/hip ratio that measures abdominal obesity were not routinely available. A more precise differentiation between peripheral adiposity and central compartment adiposity would have served to support the suggested hypothetical explanation about the role of a high BMI in prolonging survival in our patient population. Regarding the detection of our end points, a number of non-fatal and/or asymptomatic or silent MIs might have not been reported, especially if these occurred outside the hospital. Noting that in patients who have a contraindication to a treatment option (eg, β blockers), the lack of benefit from this treatment is not physician induced but determined by the patient's condition, which may itself put the latter in a higher risk category. This will in the future need to be addressed in a prospective study. Clinical measurement, rather than self-reported height and weight, would have provided a more accurate BMI data, eliminating any possible bias. OMT was defined according to patient medication at first time of contact but no information of duration or compliance of such treatment was available. Objective parameters of lifestyle modifications and risk factor control would shed light on the importance of such an intervention on clinical outcome. In conclusion, the results of the current study show that BMI is inversely related to long-term mortality in patients treated with PCI. Patients with a low BMI are on suboptimal medical treatment when compared with those with a high BMI. However, a more optimal medical treatment in the obese group may explain the improved outcome in these patients.
. Obesity as an independent risk factor for cardiovascular disease: a 26-year follow-up of participants in the Framingham Heart Study. Circulation 1983;67:968–77.
. Body-mass index and mortality in a prospective cohort of U.S. adults. N Engl J Med 1999;341:1097–105.
. Obesity and cardiovascular disease: risk factor, paradox, and impact of weight loss. J Am Coll Cardiol 2009;53:1925–32.
. The obesity paradox in patients with peripheral arterial disease. Chest 2008;134:925–30.
. Obesity paradox in patients with hypertension and coronary artery disease. Am J Med 2007;120:863–70.
. Body mass index, periprocedural bleeding, and outcome following percutaneous coronary intervention (from the British Columbia Cardiac Registry). Am J Cardiol 2009;103:507–11.
. Low-normal or excessive body mass index: newly identified and powerful risk factors for death and other complications with percutaneous coronary intervention. Am J Cardiol 1996;78:642–6.
. Impact of body mass index on outcome after percutaneous coronary intervention (the obesity paradox). Am J Cardiol 2002;90:42–5.
. Impact of body mass index on in-hospital outcomes following percutaneous coronary intervention (report from the New York State Angioplasty Registry). Am J Cardiol 2004;93:1229–32.
. The impact of obesity on the short-term and long-term outcomes after percutaneous coronary intervention: the obesity paradox? J Am Coll Cardiol 2002;39:578–84.
. The impact of body mass index on short- and long-term outcomes inpatients undergoing coronary revascularization. Insights from the bypass angioplasty revascularization investigation (BARI). J Am Coll Cardiol 2002;39:834–40.
. Association of body mass index with outcome after percutaneous coronary intervention. Am J Cardiol 2003;91:472–6.
. Obesity paradox in a cohort of 4880 consecutive patients undergoing percutaneous coronary intervention. Eur Heart J 2010;31:222–6.
. Impact of body mass index on the Five-year outcome of patients having percutaneous coronary interventions with drug-eluting stents. Am J Cardiol 2011;108:195–201.
. Medical therapies and invasive treatments for coronary artery disease by body mass: the “obesity paradox” in the Get With The Guidelines database. Am J Cardiol 2007;100:1331–5.
. The influence of polyvascular disease on the obesity paradox in vascular surgery patients. J Vasc Surg 2011;53:399–406.
. Unrestricted utilization of sirolimus-eluting stents compared with conventional bare stent implantation in the “real world”: the Rapamycin-Eluting Stent Evaluated At Rotterdam Cardiology Hospital (RESEARCH) registry. Circulation 2004;109:190–5.
. The unrestricted use of paclitaxel- versus sirolimus-eluting stents for coronary artery disease in an unselected population: one-year results of the Taxus-Stent Evaluated at Rotterdam Cardiology Hospital (T-SEARCH) registry. J Am Coll Cardiol 2005;45:1135–41.
. Clinical guidelines on the identification, evaluation, and treatment of overweight and obesity in adults: executive summary. Expert Panel on the Identification, Evaluation, and treatment of overweight in adults. Am J Clin Nutr 1998;68:899–917.
. 2009 focused Updates: aCC/AHA guidelines for the Management of patients with ST-Elevation myocardial infarction (updating the 2004 guideline and 2007 focused Update) and ACC/AHA/SCAI guidelines on percutaneous coronary intervention (updating the 2005 guideline and 2007 focused Update): a report of the American College of Cardiology Foundation/American heart association Task Force on Practice guidelines. Circulation 2009;120:2271–306.
. Association of bodyweight with total mortality and with cardiovascular events in coronary artery disease: a systematic review of cohort studies. Lancet 2006;368:666–78.
. A paradox resolved: the postprandial model of insulin resistance explains why gynoid adiposity appears to be protective. Med Hypotheses 2003;61:173–6.
. The relationship between cholesterol and survival in patients with chronic heart failure. J Am Coll Cardiol 2003;42:1933–40.
. Commentary: understanding the epidemiology of overweight and obesity–a real global public health concern. Int J Epidemiol 2006;35:60–7; discussion 81–2.
. Body mass index and mortality in men: evaluating the shape of the association. Int J Obes (Lond) 2007;31:1240–7.
. Hypothesis concerning the U-shaped relation between body mass index and mortality. Am J Epidemiol 1997;146:339–49.
. Efficacy of perindopril in reduction of cardiovascular events among patients With stable coronary artery disease: randomised, double-blind, placebo-controlled, multicentre trial (the EUROPA study). Lancet 2003;362:782–8. Contributors LS, MM, RMO, ML, PdJ, R-JvG, PWS and RTvD took part in the interpretation of findings and in drafting the manuscript. LS did the statistical analyses. LS, MM, PdJ, R-JvG, PWS and RTvD contributed to the data collection. LS, MM and RTvD took main responsibility for conception and design and for writing of the manuscript. PWS was the primary investigator of the trial. All authors made an final approval of the version to be published. Funding This research received no specific grant from any funding agency in public, commercial or not-for-profit sectors. Ethics approval The study was performed in line with ethical guidelines in accordance with the Declaration of Helsinki. Data are presented in aggregate and no personal health information is disclosed. Data sharing statement Further information and details on the prospective percutaneous coronary intervention registry data from which this study is derived is available at request from the Erasmus University Medical Centre, Rotterdam, the Netherlands.